Some couples opt for a “sweetheart table” …a small table somewhere off in the corner where you can eat and have a private conversation while still keeping an eye on everything going on. My personal preference is to keep the social interaction and the face stuffing separate, BUT some still insist upon working the room during dinner. One answer to this problem is to include 2 extra chairs at your sweetheart table. This would allow guests to come by and talk with you while you’re eating….kind of like speed shmoozing! Now on to my favorite part of this blog; making things pretty. 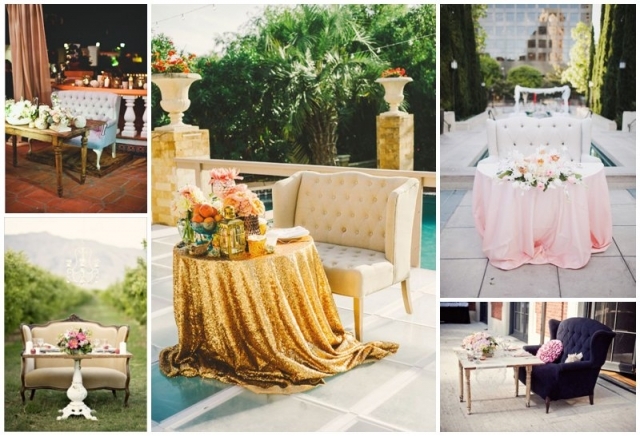 If you do choose to have a sweetheart table, there are so many ways to make use of the wedding decor to make your table extremely romantic and special (think 1-on-1 dates on the bachelor….). The best way to up the cuddle factor? A love seat. If you need some more elbow room, or truly want to feel like the reigning king and queen of the night, another option for seating is to splurge on two nice chairs for the sweetheart table. For the first wedding I ever planned (aside from my own), I dragged these two chairs out of the bride’s mom’s house to use at the sweetheart table!! 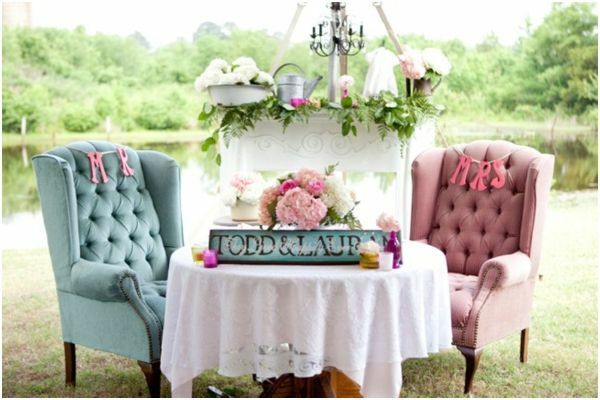 You could also add some special signage or decor to the couple’s chairs to set them apart from the rest. A great way to get as much use out of that altar/ceremony backdrop as possible would be to use it again as your sweetheart table backdrop! This altar usually takes a lot of effort to design but is only seen for 15-30 minutes during your ceremony, so why not have someone re-locate it to get the ultimate bang for your buck! ?